You’d think that being a Time Lord now that I wouldn’t need to be scrambling around at 11.30pm trying to finish Monday’s comic, but apparently lukesurl.com updates are pivotal events in the history of the universe that cannot be changed. I sure wish I knew the Banach-Tarski paradox well enough to make a witty comment. What is an anagram of “Banach-Tarski”? This did wonders for Humpty and Dumpty. Taking it one step further into Time Lord geekiness beats Humpty-Dumpty! Wish I’d made that connection. Haha! 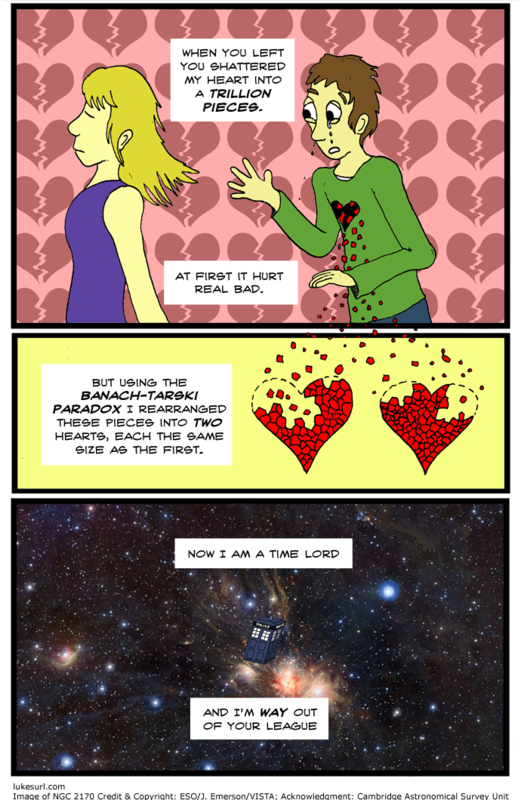 Not only would being a time lord help in making comics, but the Banach-Tarski paradox would make two of you to double the output! It’s hopeful That I follow xkcd too, so I know the banach-tarski theorem already! Just win. Makes you wonder if the Daleks could have done the same in the last episode with Eccelson, but whatev. The point is you’re hilarious. Heh I stumbled this while i was watching the Runaway Bride Christmas special. She’s ugly anyway, look at the shnozz on her! … You know appearances? Not important. You are probably male. I don’t mean to be sexist, just going based on past evidence. Great comic, and just what I needed when my boyfriend dumped me. I showed him this a week after he walked out on me. Sadly, a trillion pieces is not NEARLY enough to assemble the two requisite hearts. So, based on the assumption that my heart is ovoid-ish, and roughly the same size as my fist (and that i have an average-sized fist xD) the volume of an average human heart is about 4 pi times 120x90x75mm = about 0.0102 cubic metres. If I divide that volume equally into a trillion i’ll get cubes that are (10.2 x ten to the power -15) cubic metres in volume. Sounds impressive, and it equates to cubes of side length about 22 micrometres, which is smaller than you can see. But to get down to the size of a carbon atom you’ve got to scale the volume down by about a further thousand trillion times (until you get 10.2 x ten to the power -29 cubic metres). Of course, if you want to go down to proton level, you’ll have to divide the volume again, by about a further ten thousand trillion times, but at that level most of the volume (like 99.99%) is empty space, so you won’t actually have to divide it into that many bits to account for all of the mass.